Order your Authentic Gonzo Muppet Replica. Only 2,500 Gonzos will be produced. The Kermit Muppet Replica and Animal Muppet Replica are also available in limited supply. Anthony McElrath (February 13, 2008) - The wait is over. The time of the weirdo has finally come. The fine folks at Master Replicas have now given us three Photo Muppet Replicas and I'm happy to say that they have really outdone themselves with their latest release, the Great Gonzo Muppet Replica. Muppet fanatics know that his production schedule hit a few bumps in the road. Even though compromises had to be made, the outcome was definitely worth the wait. Just in case you don't know what a Photo Muppet is, all of the Muppet photos that you see in calendars, magazines, DVD and album covers, are not really hand operated puppets, but rather life-sized posers created specifically for photo shoots. The posers are full-bodied representations of our favorite Muppet characters, usually crafted just like their puppet cousins with a few exceptions: wire armature skeletons for posing and no hand-operated mechanisms (like moving eyes or blinking eyelids). 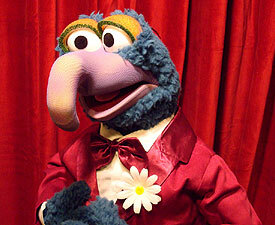 This definitely does not take away from their charm, as you will see in the accompanying photographs of Gonzo. Our favorite weirdo isn't bothered by small spaces, so he doesn't mind at all that Master Replicas has shipped him in another beautiful collector's box. Character sketches decorate the outside, while the silky brown inner case finds Gonzo comfortably awaiting his release. As always, a numbered plaque, display stand, pamphlet, certification, registration card and care instructions are included. Though exquisitely presented, the Great Gonzo begs to be taken out of his box. I was actually grinning from ear to ear before I took him out. Gonzo's blue fluffy fuzzy fur is spot-on, not to mention the little wisps of ostrich feather hairs sprouting atop his head. His weight is very close to the Kermit Muppet Replica, maybe a little heavier, but when you hold him and look into his face, you feel like you are meeting the real little blue dude. Although in my opinion, his eyes are spaced ever-so-slightly too far apart, the likeness is definitely there at first sight. The netting over his nose and mouth is noticeable right away, but really only at first. In fact, the closer you get, the more the tiny woven rings stretched over his nose look like evenly-sized foam cells. The real Gonzo head is made from a block of Scott foam, but that material is known to decay over time, so I can definitely see why the netting was chosen as an alternative so that Gonzo would last for many years without deteriorating. In most of the early pictures supplied by the Master Replicas team and taken by Comic Con participants, Gonzo's nose looked completely off. Hardly any pictures were able to do him justice. Hopefully the pictures you'll find here and in the Muppet Central Forum will better showcase his likeness, but you have really got to see him in person to truly appreciate the masterful artistry that was accomplished. As with the Animal Muppet Replica, Gonzo's moving eyelid frames are visible, but oddly they are not as bothersome in this case. I have seen many pictures of the actual poser and it does seem to be visible at times. I haven't modified this on my own Gonzo. I'm not even sure that it'll be necessary, but we'll see as time goes on. The great Terry Angus (real-live Muppeteer and puppet builder) followed the official patterns of the actual Gonzo poser in the prototypes he sent to Master Replicas, so I don't feel that taking away any points for this tiny little gripe is justifiable. The half-star is really only missing due to his pupil placement which is unfortunately one of the hardest-to-remedy factory quality control issues for some reason. It is easily fixed at home with a little time and patience. Besides, I've always thought that making your own personal tweaks was kind of fun. Naturally, costume design is another one of the first things you will notice. Wow, a full-blown tux, complete with bow tie and shiny black shoes. 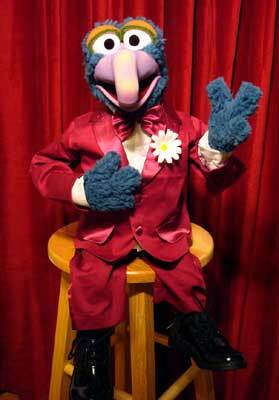 Gonzo's suit is perfect in every way. Muppet purists (myself included) were horrified to see what seemed to be a pink tux in a lot of web pictures, thankfully this is not the case. 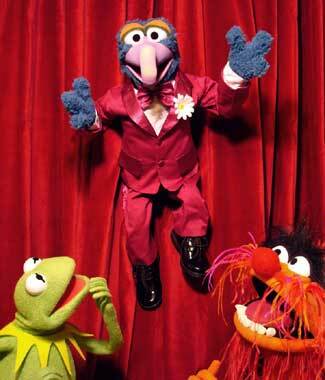 Gonzo is wearing a dark maroon purplish suit, just what you might remember from the early seasons of The Muppet Show. It's very classic, very Gonzo. A silky material is used for his bowtie, buttons, pockets, pant-seam stripes, and lapel, the last of which has a little flower attached to complete the look. (Please note that the flower seen in some of my pictures is a replacement to add to the realism). 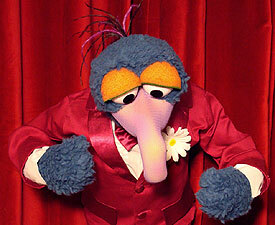 Underneath the suit, Gonzo is wearing a white long-sleeved dress shirt and black socks with little black shoes. Once you work out the stiffness in his joints, Gonzo really comes to life. He's immediately ready for his next act, although in my pictures he simply seems to like sitting. Perhaps he'll have more to do once I open a chicken farm or unload the circus canon, either one will work fine I suppose. In any case, Gonzo is extremely poseable. His ankles, knees, hips, shoulders, arms, elbows, wrists, fingers, neck, mouth and foamy eyelids are all adjustable. The half-star is due to his mouth not being able to completely shut. I understood when the same problem arose with Animal, as he's got a very thick tongue, but this really shouldn't be an issue with Gonzo. It's not too big of a deal once you get over it, but I am slightly disappointed nonetheless. It's quite a bigger deal than the fixable pupil placement. The little blue guy is very much a “whatever” overall. (Beginning with The Muppet Show, Gonzo's origins have usually been referred to him being very generic, in terms of“whatever”.) I'm really looking forward to getting more props to pose with Gonzo and the Muppet gang, but for now he's very entertaining. He continues to end up in whatever room I happen to be occupying and that's just fine with me. Gonzo is loads of fun, even if you do just stare at him in awe like I've been doing. He's a great addition to your Master Replicas Muppet collection. Kermit and Animal are happy to have another old friend to hang out with. 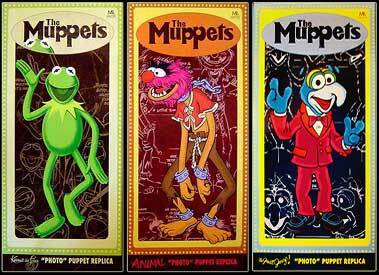 Don't be left out in the cold, buy a Gonzo Muppet Replica today. Yeah that's right, he's absolutely worth the suggested retail price of $299, and he's a Limited Edition of 2500, so act now before it's too late. This is a fantastic Muppet product that (I'm happy to say) I very much want to share with you and the only way I can truly share that is if you've got your own Gonzo to stare at too. Gonzo would definitely be a five-star weirdo if, out-of-the-box, his pupils were placed correctly as a standard and if his mouth could close completely. Those are just two issues that shouldn't even be a factor. However highly debated as it may be, the nose-netting was a required design choice in order to maintain longevity as a collector's item. Even Master Replicas' Travis Allen has shared his own frustration of trying to find an alternative that would more closely resemble Scott foam, but in the end, the netting was really the only feasible option approved. Yes, Gonzo is still being labeled as a "replica", and yes, I would have paid more if they had taken a chance and built his nose out of foam (as I am among the collector group who would definitely take extreme care of him), but the substitute works magnificently. I am a huge Muppet fanatic myself, wanting only accuracy with these guys, but I do see the reasoning behind this decision. I'd like to say that this limited edition of Gonzo is as close as anyone is going to get to the real thing. It is the definitive Gonzo collectible and money very well spent. If you've had any reservations about adding him to your Muppet family, don't hesitate any longer. Buy the Gonzo Replica today. Once this weirdo comes home to you, you'll see that you've made the right decision. The Kermit Replica and Animal Replica won't be around for much longer as well. Here's an easy, how-to-guide if your Gonzo's eye focus is slightly off. 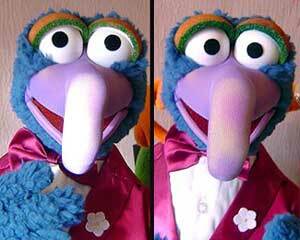 An example of an unaltered Gonzo (left) with the reported eye focus issue. Thankfully, this can be easily fixed (as seen on the right). First, note the existing pupil size on Gonzo and choose the correct circle shape from a plastic stencil set (easily found in art and craft supply stores). Trace the dot on the back of the black flocked adhesive paper. Cut carefully around the line with a pair of sharp scissors. Second, scrape the pupil material from the poser's eye. The scraping off of the existing Gonzo pupil can and should be done with one's fingernail. Gently clean the plastic area with a cloth and rubbing alcohol. Third, peel the backing of the new pupil and place it on the eye white. The newly cut pupil material has a bit of a thickness and "give" to the adhesive that make it easy to reposition multiple times after application without losing its tack. It's best to look at a still image of Gonzo to access the best placement. For ten dollars plus shipping you can make enough pupils to replace the entire ending scene of Muppets in The Muppet Movie twice over. It's an incredible improvement. Most Gonzo posers appear to have each pupil placed over half a centimeter off the mark. Now when I look at Gonzo or Animal, I'm looking at them not just their eyes. And they seem to be looking back.